Protestors and supporters of a variety of causes started gathering at 8 a.m. today for the 1 p.m. LA Unified school board meeting, facing intense heat outside and an overcrowded meeting room inside. 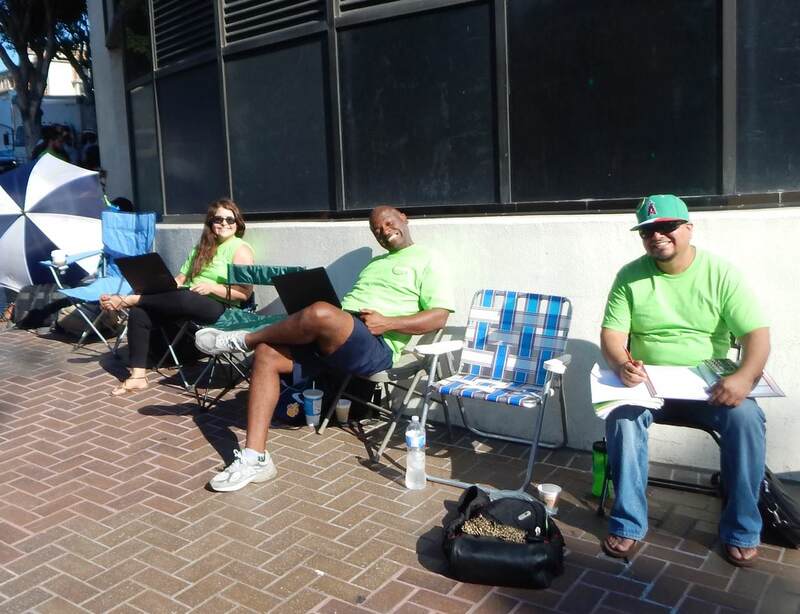 Among the earliest to appear were 50 people with green shirts and buttons showed up for the Green Dot Public Schools, which will have four charter schools before the board for five-year contract renewals. “We have another bus load of people coming, we have about 75 parents, teachers and administrators coming, and we know we have to get here early because the board room is small,” said Larry Fondation, director of community engagement for Green Dot. Capacity at the LA Board meeting room is 155. Some came prepared with folding chairs, umbrellas and laptops, but by 11 a.m. it was sweltering outside. When doors opened to the blaring sun, a few people came inside for the air conditioning, but school police wouldn’t let them sit there once the board members disappeared into closed session. The lines were expected to swell. KIPP Charter school representatives began lining up early, and two groups were planning protests before the 1 p.m. meeting. UTLA, the teachers union, scheduled a protest of the Broad charter expansion for the afternoon, and SEIU Local 99, representing classroom teacher assistants, after-school workers and supervision aides, are showing up to ask for health benefits. Some of the local’s 7,000 workers who are without access to the same benefits enjoyed by their colleagues are also parents of students in LAUSD schools. “By extending benefits to all employees, working parents will be able to provide their children with the care they need and not have to deny them medication or a doctor’s visit because the family just cannot afford it,” said Max Arias, executive director of the local.